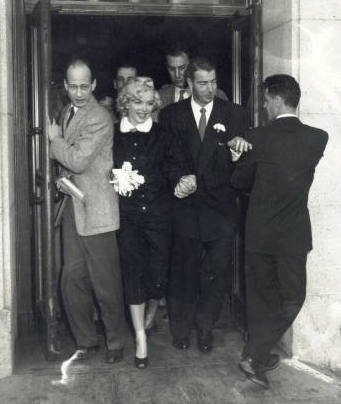 She and Joe DiMaggio were married in San Francisco on January 14, 1954. They travelled to Japan soon after, combining a honeymoon with a business trip previously arranged by DiMaggio. For two weeks she took a secondary role to DiMaggio as he conducted his business, telling a reporter, "Marriage is my main career from now on." 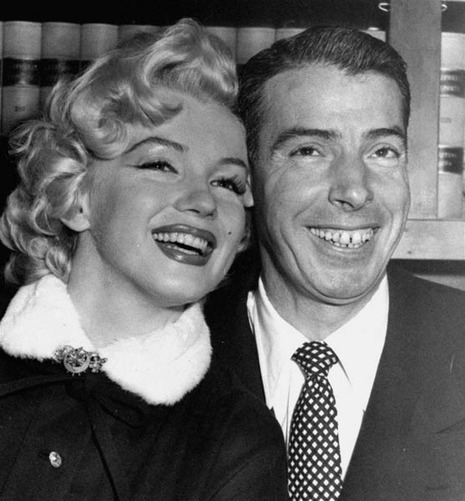 Joltin’ Joe Di Maggio wedded the girl of his and many other men’s dreams yesterday afternoon in the San Francisco City Hall. Marilyn Monroe, who packs no mean jolt herself, said she was very happy. Di Maggio said he was also very happy. Also happy was the battery of columnists which has spent no little time in the past two years running down rumors that the two were already secretly married, were to be married, or were not speaking to each other. The time and place of the wedding was kept a closely guarded secret and only about 500 people managed to hear about it in time to turn the corridors outside Municipal Judge Charles S. Perry’s court into a madhouse.